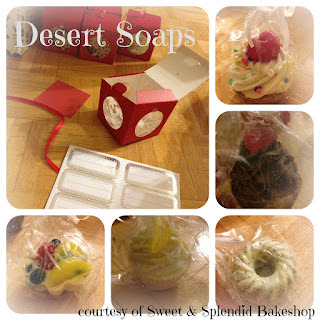 My good (and multi-talented) friend Danielle over at the Sweet & Splendid Bakeshop has a new hobby: soap making. She seems to have found a perfect way to expand her desert empire. When I saw these soaps for the first time my initial reaction was to want to lick them. Not only do they look exactly like the real thing, but they smell pretty darn delectable as well. Wanting to share these incredible soaps, I purchased a nice variety of them. Currently, they are packaged up in Martha Stewart Cupcake gift boxes that I bought from Winners, ready to be given to their intended giftees (who shall all remain nameless for the time being). *The Strawberry Shortcake soap and the Sweethearts Valentine soaps are brand spanking new and I want like 25 of them.